About | Roger Cummiskey - ArtRoger. 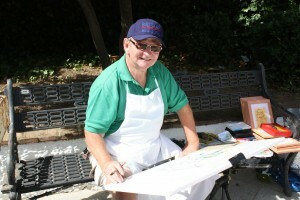 En plein aire – Mijas Pueblo 2012. Roger, from Dublin, Ireland is a full time painter. Professional Member of Visual Artists Ireland – VAI. Member : The Artists’ Resale Right (ARR) (Droit de Suite) in Ireland – IVARO. Member APLAMA – La Asociación de Artistas Plásticos de Málaga. Member Asociación Española de Pintores y Escultores – AEPE – Malaga. Member Asociación de Acuarelistas de Málaga – AAM. Member of NADFAS – Costa del Sol Decorative and Fine Arts Society, a Member Society of NADFAS (UK). I am a former CEO in a voluntary capacity of Very Special Arts, Ireland, – part of the International Charity founded by the sister of the late President of the United States of America, J F Kennedy, and former US Ambassador to the Republic of Ireland, Jean Kennedy Smith in 1975. I was a Board member of Eucrea Ireland Ltd. part of the European Communities Helios programme. “Roger is a Dublin Watercolourist, living in southern Spain. He has developed a unique individual style and specializes in paintings that take their themes and titles from the wanderings and writings of James Joyce, Samuel Beckett, Miguel de Cervantes and other Literary and Historical personalities. He is a recognised Joycean artist. Roger´s paintings have been exhibited in Australia, China, Finland, France, Italy, Spain, Sweden, Switzerland, UK, USA, and in many national and private shows in Ireland. His paintings have represented Ireland at the Florence Biennale and also at International Art Exhibitions in London, Stockholm and New York. The James Joyce Tower Museum. via Steve Hall – The Shirt. École du Sépulcre. Plerin, France for Japan victims. Member The Artists’ Resale Right (ARR)(Droit de Suite) In Ireland – IVARO. Chairman of the Andalusian International Artists Group – AIA-Group PAIA. Member Asociación Española de Pintores y Escultores – AEPE. Member Asociación de Acuarelistas de Málaga – AAM. Member APLAMA Member of NADFAS – Costa del Sol Decorative and Fine Arts Society. Cummiskey’s paintings are available internationally. One Bedroom Apartment – Fuengirola, Spain 2012. Two Bedroom Apartment – Spain in the sunshine. Breaking News – This is a blog of updating anecdotes.